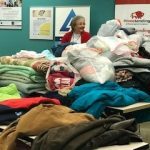 The 2018 Winter Warmth cold weather clothing and blanket drive organized by the Community Service Committee was a great success! DAAR members dropped off coats from the end of September through November 12th. 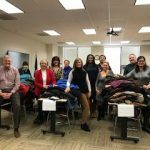 The Community Service Committee collected and distributed 20 huge bags of clothing, sheets and blankets to Mobile Hope, LAWS and The Loudoun Cold Weather Shelter. These donations will help keep many individuals and families warm during this cold winter. A big “thank you” goes out to all of our members that participated!